Last week I previewed the first two lovely books in the Kids' Crafternoon series to which I contributed some projects. The books were edited by the lovely Kathreen Ricketson of Whipup fame. Kathreen also publishes Action Pack - a fabulous e-mag full of activities for children. Kids and creativity is a subject she's obviously passionate about (as am I) so I decided to ask her a few questions on that very topic. What advice would you give to parents who want to nurture their children's creativity, but who don't think they are creative themselves? I think that everyone is a little bit creative - they just don't realise it - or else they have forgotten it. You don't have to knit, sew or draw to be creative - you could be a gardener, a shed tinkerer, a natural actor, a great story teller or a wonderful cook instead. Sometimes getting creative can be as simple as a paint set and some paper - or it might be making mud pies in the garden, or it could be using your empty toilet roll collection to make finger puppets. Use your talents and passions to encourage your kids to get creative with you. I think that adults need to nurture their creativity just as much as children - or maybe even more, for children it comes naturally you just need to give them a teeny tiny nudge and they are off. Somewhere along the way in growing up and getting jobs and becoming responsible, we adults have forgotten to be creative and forgotten the joy and freedom in being creative. 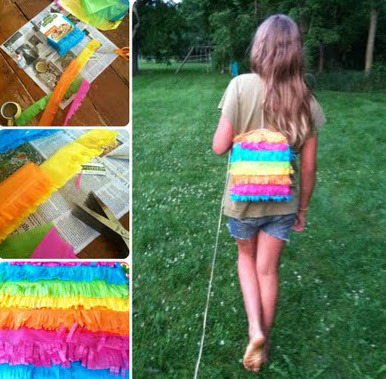 Being with children and giving them a helping hand is a great excuse for adults to rediscover their creative side. What do you think are the most important reasons for encouraging kids to be creative? 1. Creativity gives you the freedom to get messy and explore new ideas. Creating and exploring new ideas helps our cognitive development, increases our abstract thinking and problem solving skills - and we master new skills too. 2. Creativity creates feelings of well being towards others and yourself. Being in that mode of relaxation and joyous concentration actually has health benefits, decreases our levels of stress and makes us worry less. We become more confident and have higher self esteem, we are likely to achieve more in other areas as a result. 3. Living the life you dream - knowing that creativity does matter. Not being just a consumer, but putting back into society rather than just taking from it. I really love Kathreen's thoughtful answers - I think she's given us a lot to ponder. Thanks Kathreen. 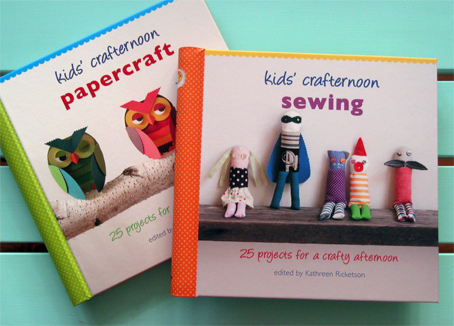 If you want to get in and start making with your kids (or nieces and nephews, grandchildren, etc) a great place to start is the Kids' Crafternoon Sewing and Papercraft books! I have one copy of each book to give away to Australian residents. Just leave a comment about kids and creativity - things you like to do with your children, something you liked to do as a child, your thoughts on kids and creativity... anything. But don't get worried about what to write, the winners will be chosen at random. Please also tell me which book you would like to win. The first person chosen in the random draw will get the book of their choice. The two winners will be picked at random on Monday 1st August. Australian residents only please. If you'd like to purchase your own copy of the Kids' Crafternoon books they are available on Booktopia.